Bottled, canned, organic, and homemade juice. Firstly, bottled juices offer two advantages; 1. They are typically larger than cans. Since I like my bloodies big and fat, this is better. 2. Unlike a punch-top can, the plastic bottles are resealable. There’s nothing worse than the metallic taste of a half can of tomato juice after it’s sat in the refrigerator for a week or two. The downsides are higher price and potential degradation of flavor due to exposure to light. 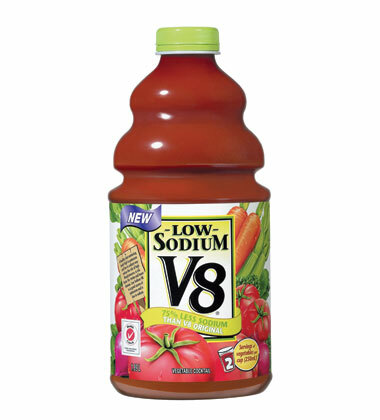 The most common varieties of bottled tomato juice are Campbell’s, Mott’s, and V8. I’m not a big fan of Campbell’s. It tastes very similar to their soup. Mott’s is too salty. V8 is better, but the regular recipe runs a bit salty. I go for the low sodium V8 in the bottle. Canned is the most common form in which TJ is sold. It’s the least expensive to package and ship. It also protects the juice from the potential degrading effect of light. Because of these advantages, it’s the most common, least expensive, and offers the widest variety of brands. As mentioned, the main downside to cans is that a tool is needed to open them and, once opened, juice flavor can degrade quickly. Travelling with an open can is a bit tricky too. Campbell’s, Red Gold, Sacramento, V8, and Mott’s are the most widely available. At MBFBM, we have tried them all. Again and again, we come back to Sacramento. The price is good and the flavor is consistently rich and satisfying. In this day and age of genetically modified plants, chemical preservatives and pesticides, many are choosing to use organic products. 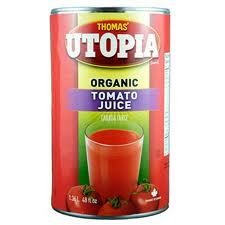 There are several good organic tomato juices available. Most are from smaller producers with only regional distribution. Nothing wrong with that- shop local! Check with your local food co-op, or specialty grocery for the best selection of organic juices. It’s a great option, but it will cost, on average, 50% more than non-organic corporate brands. As demand increases, this will probably change. Finally, there is the highest level of taste with the lowest level of convenience: Homemade tomato juice. If you have the time and the tomatoes. try it out. It may spoil you though. Nothing from a can or plastic bottle will stand up to the bold fresh flavor of home-made TJ! Homemade Tomato Juice, is delicious and nutritious. You can drink it fresh, or can it for winter consumption. Best of all, you control the spices and flavorings you put in. Once you master the knack of making tomato juice, you can make it taste just like store-bought …… by adding a ton of salt. But, you are making it fresh to eat healthy. So just a little salt, and a whole lot of herbs, will make for a sensational tomato or vegetable juice. Here’s a recipe on how to make homemade tomato juice or vegetable juice. Tomato Juice or Vegetable Juice? 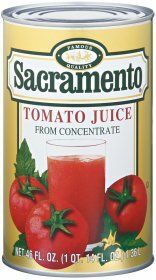 Tomato juice is made with tomatoes, and not other vegetable ingredients. Vegetable juice includes tomatoes as the main ingredient. The addition of any combination of other vegetables, turns tomato juice into a tasty, nutritious, vitamin filled vegetable juice. When this author’s kids were little, they loved to make “V-4″ and V-6” , and so forth. We used a wide variety of vegetables that were ripe in our garden, when we are ready to make it. So, each time we made it, we enjoyed a slightly different taste. Wash tomatoes, remove stem, and cut into quarters. Peeling is not necessary. The peel and seeds will be extracted in the strainer. Place cut up tomatoes into a 7 quart, or larger, cooking pot. Fill almost to the top. If making a vegetable juice, add any or all, additional vegetables. Cook until vegetables have softened. Strain off some of the water, which will rise to the top. Put into the refrigerator for fresh juice. Or, can for winter consumption.